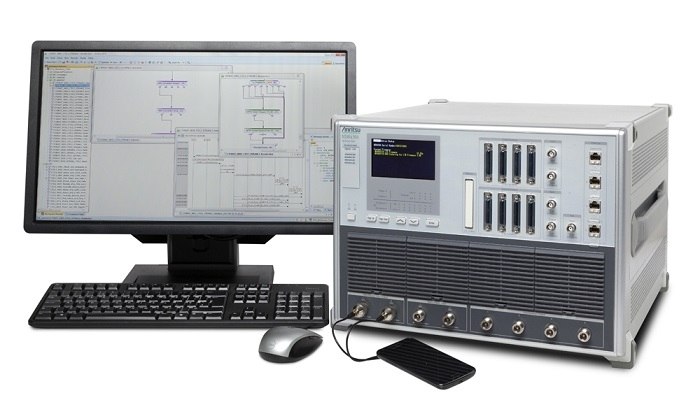 Anritsu has introduced software options for its Signalling Tester MD8430A that expand the LTE-Advanced Pro (LTE-A Pro) testing functions of the base station simulator. With the new software options, the MD8430A supports Gigabit LTE and Cellular IoT scenarios to create a comprehensive test solution that can efficiently verify LTE-A Pro-compliant chipsets and wireless devices. The new functionality enables engineers to use the Signalling Tester MD8430A to conduct Downlink 5 Carrier Aggregation (DL 5CA) and Uplink 3 Carrier Aggregation (UL 3CA) IP data throughput tests of LTE-A Pro terminals. Effective communications speed tests under an SCME fading environment, and Cat-M1 and NB-IoT protocol tests can also be conducted with the MD8430A base station simulator when the new software is installed. To lower cost-of-test and improve measurement efficiency, the MD8430A can output multiple base station signals from one Tx antenna if all the signals are within the same band. This capability eliminates the need for multiple test sets even when Tx signals are increased due to additional component carriers. With excellent relative level accuracy between antennas, the MD8430A fading function supports configuration of a high-reproducibility fading environment for greater measurement confidence. This is difficult to achieve on a live network. In addition, the base station simulator supports slow-clock tests required for debugging during the initial stages of chipset development. The MD8430A supports the LTE-A Pro standard and is the centerpiece of a benchtop simulated network used to evaluate chipsets and data terminals during development. Built-in standalone fading functions allow the MD8430A to control fading in synchronicity with mobile communications tests to support LTE-A tests. It can be used with the Anritsu Rapid Test Designer (RTD) MX786201A software to establish a GUI for easy creation of test sequences for base station simulation in a MIMO environment.